Notwithstanding the outwardly appearance of constant debate regarding China's 3G mobile standard, Chinese vendors are already accruing revenue surrounding the development of the Chinese flavor of 3G. For those of you who have not heard of this, TD-SCDMA, is the Chinese flavor of mobile 3G. The Chinese, it is argued, are trying to avoid the costs associated with primarily western patent holders for the availability of 3G Mobile. Instead they have moved the development of their own spread spectrum standard. According to Analysis International, a Beijing based IT firm, China's domestic 3G market revenue has already reached RMB 7.2 Billion in the second quarter of 2007. That's US$ 1 billion already generated by a speculative standard. China has initiated the construction of TD-SCDMA (time division-synchronous code division multiple access) networks in 10 Chinese cities in the first quarter of 2007. ZTE Corp, Datan Mobile and TD Tech were the top three vendors for the quarter, of which, Shenzhen-based ZTE led the Chinese TD-SCDMA network with a 45.8% market share, followed by Datang's 27.2% and 14.9% for TD-Tech, a joint venture between Huawei Technologies and Nokia Siemens Networks, according to Analysis. ZTE had a 33% rise in profits from the first half of '07, which was attributed to China Mobile's order for TD-SCDMA equipment, the company said in its corporate reports. Add to it, that ZTE plans to raise RMB 4 Billion (appx US$ 530 million) through the sale of five-year convertible bonds to finance the research and manufacture of Chinese developed 3G products. China Mobile has invested RMB 26.7 Billion (appx US$ 3.5 Billion) on TD-SCDMA network construction in Beijing, Tianjin, Senyah, Shenzhen, Qinhuangdao, Xiamen, Shanghai, and Guangzhou, looking to be ready to launch services for the Beijing Olympic games <51 weeks away. In addition, China Telecom and China Netcom have also extended their TD-SCDMA network expansion in the second quarter of 2007, which would be an extension of the current network in Qindao and Baoding. China Will likely issue 3G licenses at the beginning of 2008, according to the plans of the Ministry of Information Industry (MII), as China's mobile industry prepares for 3G services to be ready for the Olympics. Said Wang Jianping, an officeal at the China Center for Information Industry, "The coming 3G will bring a capital feast to equipment makers and handset vendors." Indeed. Through my personal sources I'm advised that China Mobile has already commissioned one of the large global consulting firms to help formulate a strategy against China Telecom, the fixed wireline provider in China that will be entering the 3G mobile market. I wouldn't characterize this as a "research project." Heard of "Voice SMS" or "Unified Messaging" ? Will they spell the demise of "text messaging?" Will multi-modal messaging push SMS aside? I'm a featured blogger at Mobile Messaging 2.0, and I've just posted the first of a two part series on "Is Texting Terminal?" I cover both the development of Universal Messaging, as well as the blossoming interest in "Voice SMS" companies. Check it out here. Keep your eye out for part 2 later the week of August 27 [Now Available HERE], or sign up for the mobilepointview feed to ensure you don't miss it. Tip of the hat to three Venture Capital focused bloggers in assisting in the process of securing VC funding. I've helped raise VC funds in two successful start ups, served two years as an Independent Director on a US$160 million revenue company, and now serve on three advisory boards for mobile tech companies, and I think these three sites provide outstanding information for fledgling entrepreneurs seeking venture funding. Burnham's Beat is written by Bill Burnham, who runs the hedge fund Inductive Capital. Bill is a former VC, and he provides an excellent illumination of the initial fundamentals in approaching VCs for OPM in his post last month "Ten Pragmatic Steps to Raising Venture Capital." The post includes basics such as presentation outlines, gaining clues and texture on the VCs you're targeting, and sources of information on paticular VCs and partners. Another site I've been reading and recommend as well is Soaring on Ridgelift written by Stu Phillips of Ridgelift Ventures. Two valuable recent posts are "The Pitch Deck" which covers how to craft a VC pitch, and "The List of Four Lists" which is a good strategy to pursue before you walk into the pitch meeting. The Funded, turns the tables on the subject of VC funding and the process behind it. This site provides frontline insight from successful venture fund raisers with a compilation and ratings of over 3600 VCs and the partners they worked with. A very valuable insight to have as you walk into the pitch. As Sun Tzu said: "Know thyself. Know thy enemy. Do not fear 100 battles." I've recommended all three sites to enterpreneurs who have been approaching me recently me for assistance, and I recommend them to you, too. China's news media is in full blossom of mobile adaptability. China's rapid economic development and per capita GDP growth has driven vigorous development of the media industry with a growth rate of 11.9% in 2005, two percentage points beyond that of China's GDP. In 2006, the growth rate exceeded 12%. Sub-channel growth percolates along, with the Internet, digital television, new media (mobile) and advertising all growing rapidly and especially those industries/companies related to digital TV which are expected to be the core center of investment in 2007. This is all drawn from an interesting Chinese government "blue paper" report released last month by China's MII. Noteworthy to mobile is the emergence of mobile "newsprint" offerings. Here's a synopsis of its development in China. When the web version of newspapers was first introduced, it looked like galley proofs with no layout and did not suit conventional reading habits. Subsequent PDF versions had newspaper format but were difficult to read. A breakthrough occured in February 2006, when the Zhejiang Ribao Newspaper Group and Peking University launched full digital versions for five newspapers. The visual interface of these digital newspapers made reading Chinese characters much easier. Chinese read this "mobile newsprint" via digital networks without any trouble, the same way they read traditional newspapers. Much like I read the IHT on my HTC Dash. Then came mobile voice! In March 2006, Hefei Wanbao made use of iFlytek's intelligent digital voice technology to create China's first talking newspaper. Readers only need to download the required software to "listen in" to newspapers of the Hefei Wanbao Newspaper Group via voice calls. They may choose to listen to the news in male or female voice, Putonghua or Cantonese. They can even choose their background music. The real breakthrough came from Guangdong provence through a Chinese software company, the Guangzhou Ribao Group launched a mobile e-newspaper in late 2006. What makes publishing this mobile e-newspaper attractive is that the price of the technical equipment is efficiently cheap (Rmb2,000 per unit appx. US$ 265), providing a low cost entry into the "New Media" channel. This mobile electronic version of Guangzhou Ribao has a current circulation of 20,000 copies per month. 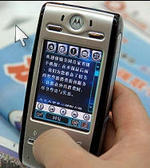 Yangzi Wanbao launched China's first mobile newspaper in July 2001, but it was not very different from ordinary SMS text messages. Mobile phone newspapers became truly popular following the growth of multimedia messaging system (MMS) format, which makes it possible to read both text and graphics on the phone. In July 2004, Zhongguo Funu Bao (China Women's News) cooperated with China Mobile to provide the first mobile phone version to MMS users. The number of mobile phone newspapers soared in 2006, involving over 10 central newspapers, over 40 mainstream local newspapers and more than 20 newspaper groups. China's broad newspaper industry has been a lackluster investment segment, with a decline in advertising growth. The plight of the newspaper advertising market has expanded with time, while readership has also been shrinking. The downward market turn in recent years has aroused the concern of both the newspaper industry and the academic community concerned about public civic awareness. Since tradtional "print" readers have a history of seeing advertisements and newstories sharing a newsprint page, expansion into the mobiel advertising space should be an auspicious omen for mobile advertising opportunities in the context of mobile newspapers as well. China's newsprint industry may well have found that mobile innovation will lead it to a richer future.